The National Museum of Surveying honors surveying’s roots and seeks to secure its future. Museums typically are dedicated to the past, but at the National Museum of Surveying in Springfield, Illinois, the history and legacy of the profession also share the spotlight with educating the next generation so that surveying continues to have a bright future. The museum opened quietly in an old clothing store last September, following a three-year process made difficult by the economic downturn. Its grand opening, scheduled for March 19, coincides with National Surveyor’s Week, March 20 to 26 (originally proclaimed by President Ronald Reagan in 1984). The museum features historical exhibits, including one that explains the role of surveying in the nation’s creation and development, and is also an educational center for all things related to surveying. The first stop for visitors is, in fact, the educational theater room (at right), provided by the National Council of Examiners for Engineers and Surveying (NCEES). The room is used to explain what surveyors do, showing videos geared to a general audience. Another facet of the room is a speaker’s kit that is provided to educators so they can explain to their students topics ranging from the purpose of surveying to how to become a surveyor. From there, teachers can branch off into other material, often incorporating surveying into math and history lessons. The next stop on the tour is the History of Surveying exhibit gallery. Displays dedicated to the tools and mechanics of surveying are incorporated with stories of actual surveyors and their importance in the country’s history. A favorite story told to visitors is “three surveyors and another guy,” referring (of course) to Mount Rushmore with its tribute to presidents Washington, Lincoln, and Jefferson—all surveyors—and Theodore Roosevelt who was not. Also told to visitors are some of the more obscure tales of surveyors, all used to paint a vivid picture of the nation’s founding and to show how surveyors affected the settlers of yesteryear, moving into the present day. This method of putting a human face on the profession gives students and adults alike a deeper understanding and appreciation of surveyors. It also brings home the point that surveyors were present in nearly every historical event of this country. 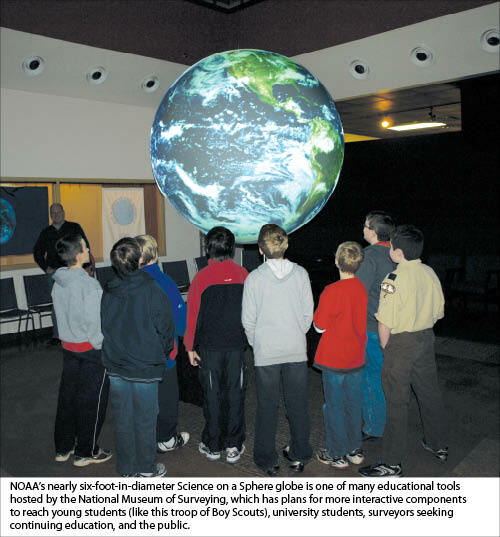 Another important educational component at the museum is NOAA’S Science on a Sphere (SOS). The nearly six-foot globe created by NOAA functions as a 360° movie screen to display Earth system data. SOS depicts a variety of awe-inspiring images, from the sun to the migration of sea turtles, illuminating the mysteries, complexities, and oddities of our universe. This exhibit also helps explain how satellites provide these images for us, as well as how they are the source of data for surveyors. We show how satellites are surveying the cosmos using the same principles that surveyors used in the founding of this country, and we explain that eventually we might need surveyors to demarcate the moon or another planet. A program, “Create Your Own Dataset,” is also part of the museum’s push for educating pupils. From elementary school to the college level, students can create maps depicting applicable topics to be used on the SOS. Technically, the SOS can show any map, image, or movie; therefore, the possibilities for projects are endless. For simplicity, the museum provides a basic map on its website that teachers can download and have their students fill in. The museum also tailors the SOS to the teachers’ own curriculum, creating playlists related to what the class is studying. This month a local university class, for instance, will be viewing a physical geography unit tailored by the museum. To help bring surveying into even more classrooms, the museum has compiled generic lesson plans about surveying to create an interdisciplinary unit. Although the lessons have been borrowed from the internet, the museum wants to create its own offerings with an emphasis on history and experiential learning. To accomplish this, the museum needs outside help in creating a curriculum guide and unit and lesson plans. Ideally, there will be a teacher packet to accompany the speaker’s kit that will also include an activity geared to each age level. The museum also holds scavenger hunts on its second level in the Capitol Reception Room. The activity allows kids to use string to create their own chain. Then, starting from a cardinal point, they use the chain, a compass, a field notebook, and directions to follow a line and find a prize. The scavenger hunts are part of “Family Days at the Museum,” held in honor of famous surveyors. The honor extends to throwing birthday parties for the surveyors on Saturdays. The parties include special presentations about the honoree and plenty of hands-on activities for the children. Although it’s mostly crafts and games, there’s still a special focus on surveying and science. A Children’s Surveying Academy is also being created by the museum. Using the theater room, the museum will present the essential skills needed to be a surveyor. Videos will show what surveyors do, and equipment will be available for the children to become acclimated so they can execute their own rudimentary surveys by the end of the academy. From all this they will understand how surveyors require knowledge of math, science, cartography, computers, geography, engineering, construction, and other discipline-specific skills. The museum hopes to become a place for Boy Scouts to earn their surveying merit badges, providing a one-stop venue with the education, fieldwork, and community service components. On the other end of the scale, there is also a plan for surveyors to obtain their needed continuing education credits at the museum. The museum does not stop at its walls. Directly across the street is the old state capitol, and a block north is the Union Station visitors’ center, both with lawns that will host the museum’s surveying “obstacle courses.” Robert Morris University (also located in Springfield) is working with the museum to develop these paths for tourists who leave the Lincoln Museum (also in the vicinity) or are visiting the historic district otherwise. The paths will illustrate basic surveying, pacing, and angle turning. To help Robert Morris University promote experimental and real-world learning, the museum will host the university’s I-Center project that allows students from different disciplines to apply their education in a realistic setting. One of their main tasks will be to create a tiered surveying course navigable by both GPS and manual instruments, offering a series of engaging sessions. 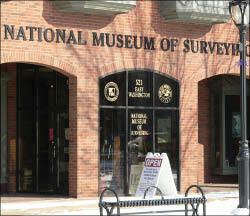 The National Museum of Surveying originated in Lansing, Michigan, as the Michigan Museum of Surveying. With plans to go national, surveyors chose Springfield. Bob Church, museum board treasurer, made a presentation to the foundation, saying the city was a perfect fit with its 500,000-plus visitors annually, as well as its location-based connection with Abraham Lincoln. In 2007, with the foundation’s approval, the museum moved to Springfield, into an old clothing store at 521 E. Washington Street. A total remodel ensued, and it appeared the museum would open with a bang. Then the housing-market bubble popped and the museum lost its fundraising capacity. Several attempted openings floundered, but in 2010, the California Land Surveyor’s Association made a generous donation that allowed the doors to open. At its grand opening on March 19, the museum will be free to the public (donations are encouraged). At 10 am, there will be a ribbon cutting by the Springfield Chamber of Commerce, and then visitors will be able to tour the museum. Every hour on the half hour a special show on the Science on a Sphere will be displayed. All through the day will be family crafts and activities for children. In conjunction with the grand opening, the museum will be kicking off a fundraising drive to support the museum and its educational endeavors. It is looking to raise $1 million by its first birthday, March 19, 2012. Although the museum normally charges admission, it truly relies on its donors to operate. Volunteers are also crucial from the education and surveying world. They run the day-to-day operations, design exhibits, manage the website, promote the museum in the community, and even tackle general maintenance duties. There is only one entry-level employee. Operating as it does with a small base of people and large dreams, the museum needs the help of surveyors from around the country. The help doesn’t have to be financial; the museum also needs stories, instruments, historical artifacts, support, and innovation from all over so it can truly be a national museum, a museum that celebrates the past while charting a future. Matthew Parbs is the assistant director of the National Museum of Surveying.